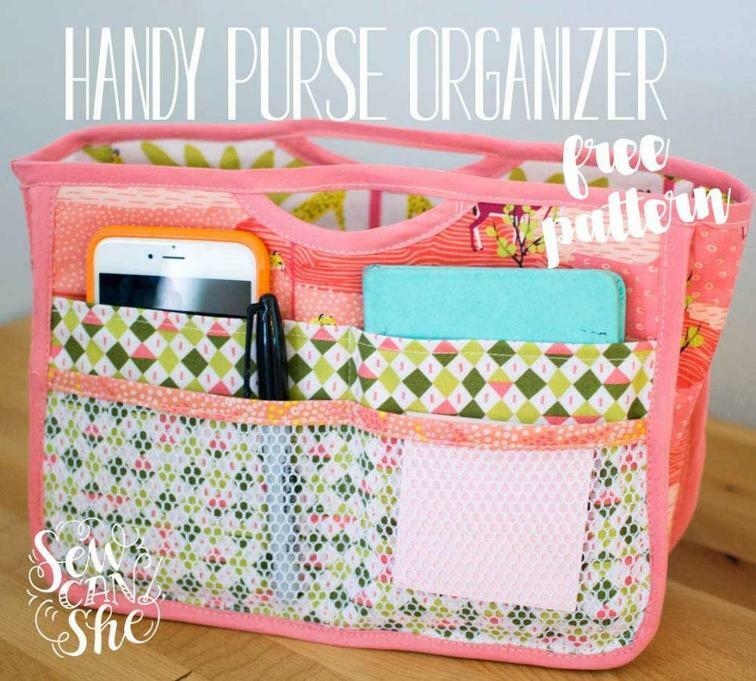 This sweet little handy purse organizer has 13 pockets – 6 mesh, 6 fabric, and one interior zipper pocket. As you can see in the photo, it is sturdy enough to stand on its own, but it will also lay flat or fit in a slim purse or laptop bag. Use it to organize and carry all your stuff from one purse to another – or around the house from one room to another. I have made this purse organizer and I absolutely love it! I had a cheap purse that had no pockets inside or out, and everything just got lost in the bottom. I made this organizer, and now I can find everything. The only thing that I would do different next time is to make the outside pockets sag or open a tiny bit more so that I can use the pockets to their full potential. With all the layers of pockets, the outside pockets are rather tight and it makes it hard to put my “stuff” in when the inside pockets are full. Does that make sense? Anyway, just a little advice for the person who chooses to make this. It’s definitely a great pattern! Hi Kathleen, thanks so much for your helpful feedback on this design. I’m sure everyone who is considering making this will really appreciate your feedback. Kind regards and happy sewing! Great tip! This just came up in my feed. Not sure if I’ve already added it, but doing so today. Why can I not Pin this to my sewing Log without it say there is a virus? Hi Deanna, this image has been pinned by a large number of people already. There are no issues that I can see. If you hover over the image, in the upper left, there is a button to pin it. Perhaps this is conflicting with something in your setup but it’s definitely not a virus on our end. Please give it another go and let me know.